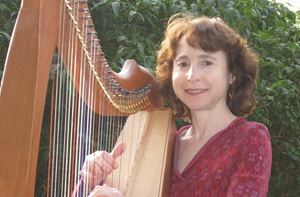 Sabrina Sigal Falls plays the Celtic harp as a ministry of healing and worship. She shares her gift of harp music in hope of touching hearts with a deep sense of God’s presence and the blessing of God’s love and grace. Whether playing in a worship service, at a wedding, a memorial, or at bedside, Sabrina plays her harp to bring beauty, joy, hope, and peace to those who hear it. With piano as her first instrument, Sabrina began to play the harp in 1985, at the age of 28. She fell in love with traditional Celtic music in her college days and listened to it every chance she got ever since. During a sad time in her life, just after the loss of her father who had suffered from cancer, she discovered the harp, which lifted her out of her grief and a deep depression. She believes that the Holy Spirit whispered the idea of playing the harp into her heart during Friends Meeting for Worship one Sunday morning in Philadelphia, where she used to live. Although she knew nothing about harps or how to even begin playing one or finding one, doors opened one after the other as soon as she said “Yes” to God’s leading to play it, and soon she had her own harp and was on her way! Although she only thought she would play for herself and family and close friends, more and more requests for her playing would come, and she began to play often in public. In the years since she has played her harp in many worship services, weddings, and memorial services. She has also played for special celebrations, receptions, dinners, benefit concerts, and coffee houses, playing not only traditional Celtic music but a wide variety of spiritual and folk as well as some popular and classical tunes. Sabrina also plays live therapeutic harp music at the bedside in hospitals, hospices, or homes for those who are sick and for those in transition from life to death. She is a Certified Music Practitioner (C.M.P. ), having completed the Music for Healing and Transition Program, a National Educational Certification Program for musicians who wish to become music practitioners. A graduate of a Quaker seminary, the Earlham School of Religion, with a Masters of Divinity degree, Sabrina is a recorded minister in the Religious Society of Friends and has served as a pastor and hospital chaplain. She lives with her family in Indianapolis, Indiana.